To help you in your quest for decorating simply this holiday season, here are a few simple and quick ways to add seasonal decor to your home that will leave you feeling stress-free. Enhance your front door with a simple wreath. The first thing guests see is the exterior of your home, so one can feel compelled to pour time into these decorations. You don't need to cover your shrubs and exterior of your home with millions of lights. While that can be pretty, small additions to the exterior of your home can make just as much of a statement. Adding a simple wreath to your front door or to a few exterior windows can add just the right amount of seasonal décor. We personally love these frosted wreaths which bring a touch of winter weather to our boutique in South Carolina. Group ornaments in a bowl to place around your home. 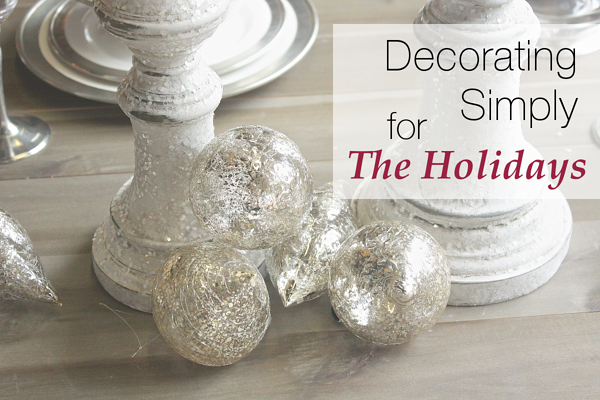 Ornaments are an inexpensive and easy way to bring the holidays into your home. If you have any extra ornaments leftover from your Christmas tree, group several of them together and place them in various sized bowls or vases on coffee tables, end tables, or buffets. This takes almost no time to arrange and can create an elegant feature without needing to purchase new decorations. You can also individually place some of your larger ornaments within your bookshelves or amidst tabletop accessories to add a hint of seasonal cheer among your already placed decor. Sticking to a color scheme with your decor can make the biggest impact. Seasonal decor that all fits within a certain color palette creates an overall cohesive look and makes the few holiday décor additions to your home really stand out. You can go with a more neutral color palette using lots of clear glass, white and silver or go with a more colorful palette using blues, greens and reds to create a stunning Christmas spread. Just make sure when pairing colors together that they complement each, not compete with each other. Tabletop trees are a great alternative to one big Christmas tree. If the thought of having to decorate a full-sized tree leaves you feeling anxious, then opt to ditch the traditional Christmas tree this year. Who says you have to always decorate a large tree? Buying one or two small faux or live trees and placing them in baskets or metal containers is a nice way to bring the Christmas cheer. Opt to leave them bare or have the kids add a few ornaments to continue the tree decorating tradition. 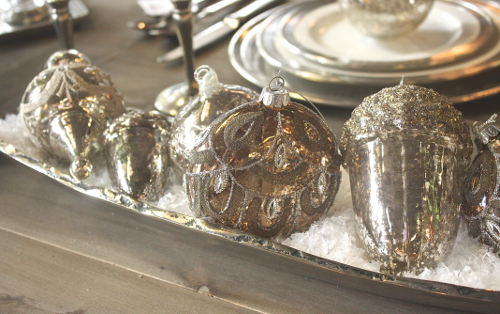 Silver or metal tabletop trees can also make a beautiful statement and require no additional decorating or maintenance. Add some simple fresh greenery. You don't have to go all out decorating your mantel and banisters with loads of greenery full of ribbons, lights, and berries. All you need are a few simple swags of fresh greenery to place on your mantel or dining table to add some fresh seasonal decor. You can choose to add a ribbon here or there, but it's not necessary. Greenery that is left as is can make a beautiful statement alone. Not only is the simple greenery gorgeous, but the fragrance is also divine. The perfect way to make your home truly feel and smell like the holidays. What kinds of decorations are a must-have in your home over the Holidays? For additional ways to decorate simply this holiday season, download these five tips from our design team.